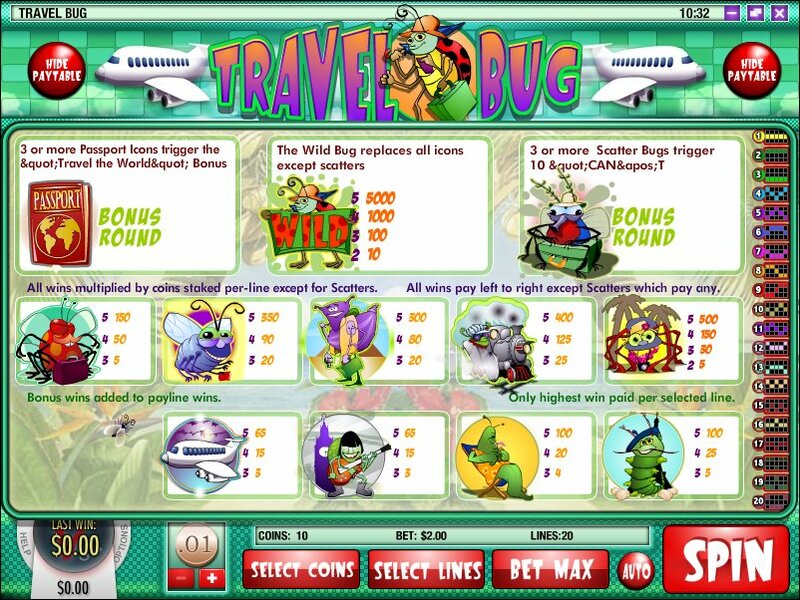 Overview: Travel Bug is a 5 reel, 20 payline, 10 coin Slot game. Travel Bug has one wild icon, 2 scatter icons and 1 bonus round. The Scatter Freespins Bug Icon is a Scatter Icon which triggers the Can't Lose Free Spin feature. If 3 of these icons appear on the Reels you will receive 10 free spins. The game will enter a Can't Lose mode for the duration of the spins. See below for more information on this feature. The Passport bonus Icon is a scatter icon which will trigger the Travel Bug bonus round. If 3 of these icons appear on the reels you will be sent to the Travel Bug Bonus Round. These symbols do not need to appear in a sequence to trigger the bonus round as well you do not need to be playing all Paylines. It can be anywhere on any of the five reels. 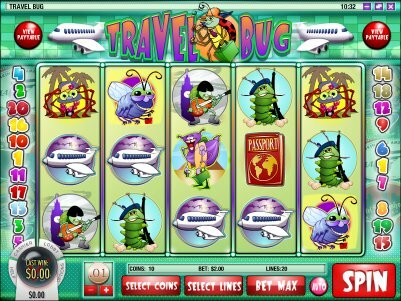 Similar Slots: If you like Travel Bug, you might like these other Rival video slot machines: Arabian Tales, Grandma's Attic, Nuclear Fishin', Watch the Birdie, Wild Carnival.